Louise Phillips Writer: Thoughts Comments Opinions with Hubert O Hearn San Diego Book Review.. 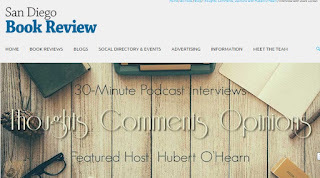 Thoughts Comments Opinions with Hubert O Hearn San Diego Book Review.. I'm really looking forward to this podcast on Wednesday....the fact that the channel has around 800,000 daily viewers, on a news service with 2.25 million subscribers, shouldn't be scary? Should it? But in my mind, I'll only be talking to one person! !